Could you have spelled "feuilleton?" Or even know what it is? The Veteran Affairs' chief faces friends of homeless veterans. Bill Gates' pal offers $2 billion for the Clippers. And two young spelling aces nail the national spelling bee for its first tie in 50 years. It's Friday and here are the 5 things to know for your New Day. Facing it head-on: With calls for him to resign hanging over his head, Veterans Affairs' Secretary Eric Shinseki will face representatives of people particularly vulnerable to his agency's medical failings today. The National Coalition for Homeless Veterans has booked Shinseki as its featured speaker at its annual conference in Washington. While he stands before them, lawmakers consider whom to hold responsible for a scandal involving the treatment of ailing veterans that has cost some of them their lives. Wouldn't it be cool if every member if Congress has to volunteer at VA hospital or shelter this weekend? Yes. I'm delusional. Bill Gates, sort of: He's even wealthier than Donald Sterling and a whole lot more animated, too. But what else do we know about Steve Ballmer, the former Microsoft CEO who's poised to take over the Los Angeles Clippers? Unlike owner Donald Sterling, whose racist remarks hurled him into a vortex of public criticism, Ballmer flew under the radar in recent months before he laid down a $2 billion offer for the team. Spellbinding: It was the first spelling bee tie in 50 years. But Sriram Hathwar and Ansun Sujoe wore the judges out. 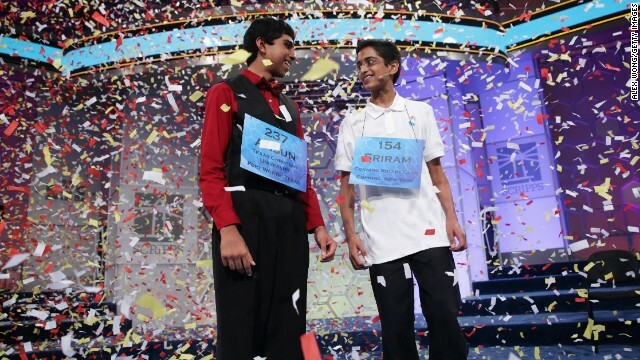 They correctly spelled so many words Thursday that the Scripps National Spelling Bee had to declare them both winners. The last word was "feuilleton" (roughly pronounced Fwooyetonh). Know what that is? Culture section of a European newspaper. Sujoe, a 13-year-old seventh-grader from Fort Worth, Texas, knew it and nailed it. Come home: A U.S. Marine who says he accidentally drove to Mexico with guns in tow is now tied to a bed in four-point restraints, a friend and fellow service member said. "I don’t think its right for any American to be in a Mexican jail treated like that. They are our neighboring ally, and it's inhumane," the friend told CNN's Nick Valencia. Space cadet express: Space travelers, get ready for a new ride. The Dragon V2 got its grand reveal last night by SpaceX founder Elon Musk, who showed off his company's new spacecraft in a live webcast. Dragon V2 marks a major milestone as SpaceX's first spacecraft capable of bringing humans to the International Space Station then back to Earth. - Skywalking: One-man-band plays Star Wars theme. - Hearing is believing: Check out these audio illusions. - Underwater stampede: Is it a flock, a covey, a school or a herd - of manatees? - Domino effect: It can be beautiful, when everything falls down. - Baby, baby, baby! : One more time, 'cause they're just so cute! Who in his right mind attempts to drive to Mexico with GUNS in his car? Mexico of all places. You're stopped at a check point to have your car searched before being allowed entrance. So what was this man's mission? Good luck with this one.